It was serendipitous, really. We were already planning pizza for dinner, but hadn’t given much thought to the toppings; usually we just go with tomato sauce, pepperoni and sliced olives if nothing else is really calling to us, and we always have those on hand. In the nick of time, though, I saw a tweet from Michael Ruhlman about a homemade pizza topped with bacon, egg and asparagus. It looked amazing, and I thought, “Why have I never thought of putting bacon on a pizza? What have I been doing with my brain all this time?” Plus I adore eggs on pizza (especially with bitter greens, like one I tasted at Serious Pie), but I haven’t ever gotten the hang of it. It was time to try again. I did my usual crust, because I still think it’s one of the best ever – just a little whole wheat, and plenty of crunch without being crackery. I like to transfer the rolled-out crust to a hot pizza stone and top it right there on the hot oven rack, which takes a bit of quick work and gets you all hot and bothered, but is much easier than trying to move a fully loaded pizza. We didn’t have any asparagus, but we did have some diced tomato left over from last week’s kebabs, so I tossed that on with the lightly sauteed bacon lardons. After five minutes I added a raw egg and let it bake another ten minutes. It ended up being a little overdone, due to my apparent inability to tell the difference between a nicely baked-but-still-runny egg and a completely raw one – next time, I’ll take it out sooner. But it was still a swell pizza, chewy and cheesy and bacon-y. It looked so good we had to cut into it while it was still molten from the oven, and burned ourselves extremely thoroughly – ouch. It was totally worth it though. We’ll be doing this again. I would have liked the yolk to be runnier, but I hate it when the white is still liquid (especially when it’s still transparent). That probably means we should use the appearance of the white, rather than the appearance of the yolk, as our indicator of doneness, huh? Never being one for cold leftover pizza the next morning like some folk I know, bacon included or not, but I’m thinking popping this in the toaster oven for a quick warm up and a cup of coffee instead of an over-easy on toast might be a nice change. Ordered a bacon cheeseburger pizza once back in the midwest. Haven’t been back since. My first pizza with bacon. It was really bad. The bacon wasn’t fully cooked (strips)and when the delivery guy handed me the box, grease poured out of a corner and onto my shoe. The burger was of questionable quality (like white). I think the cheese was fake. I’d name the place and state and town but I tend to get flamed when I do that. All I need to know is….do you deliver this far out? This looks fab! I love runny yolks for sauce. Volunteer Park Cafe makes a wonderful proscuitto & duck egg pizza. Your post gave me the courage to try it at home. Looking forward to meeting you at the IFBC! 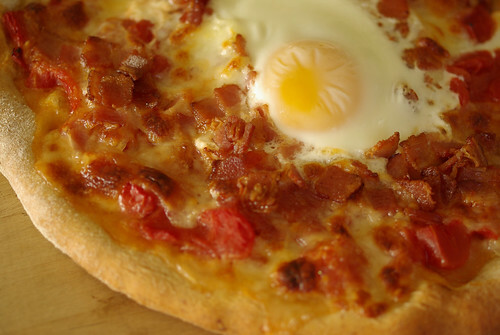 love, love, love eggs and guanciale on pizza! On youtube you can find the song,”cold pizza for breakfast”.